Det vigtigste boligareal er ca.. 25m Det er dejlige og lyse og frisk med en meget god kvalitet konge sovesofa og en yderligere dronning størrelse sovesofa - opbevaringsskabe, og stort fladskærms-tv med engelske nyheder kanaler og wifi / internet - der er klimaanlæg. Det er et lille spisebord og 2 stole. Det virkelig forbløffende aspekt af denne lejlighed - er den sydvendte terrasse gennem de dobbelte terrassedøre på solrige terrasse, som vender mod syd (får sol fra morgen til aften solen) Terrassen har bord og 2 stole og en meget behagelig liggestol. Vinduerne er termoruder og der er en elektrisk lukker. Terrassen er ikke overset (du bare kigge ud til havet og palme) Dette er en dejlig lys og studio lejlighed - meget god kvalitet seng 1. 6m x 2m og sovesofa. Badeværelset har et badekar - med bruser vedhæftet fil, håndvask og toilet - det er flisebelagt hele. Køkkenet har en 4 plade komfur, mikroovn, køleskab / fryser og opvaskemaskine og kedel, brødrister, kaffe peculator og fuld køkkenredskaber. Wow - Udsigten er simpelthen fantastisk! Lejligheden er perfekt for beachside storbyferie er sikker bygning og har aircondition og termoruder perfekt til par eller enkelt person søger friske og organiseret overnatning i med betagende udsigt. Denne lejlighed er udstyret med sengetøj og håndklæder og den vigtigste seng består af 2 personer. Ekstra ydelser: (hvis det kræves) bedes du anmode skriftligt, når du har booket. Eventuelle ekstra ydelser betales kontant i konvolut, der leveres i slutningen af ​​opholdet. Vi er her for at gøre dit ophold til et meget behageligt og behageligt spørgsmål, vi er her for at hjælpe - Paul Manion & The Go-Nice team. It was a disapointing meeting with the apartment. Service was dirty, chairs at the terrace were broken and the welcome package was not there - only a bottle of wine. There is a lot of noise from traffic. Problems getting on wifi because of poor info. All in all it was not at all as expected. La location devait être jolie il y a quelques années, elle est maintenant vieillotte, l’une des chaises de la terrasse est trop endommagée pour qu’on puisse s’y assoir, beaucoup de poussière et sol pas net il y avait de la vaisselle dans le lave vaisselle. Tout est écrit en anglais, il serait apprécié que le propriétaire fasse une traduction de tous les documents en français, nous sommes quand même à Nice !!! Si vous souhaitez être au calme, la promenade n’est pas l’endroit où il faut aller, le bruit de la circulation couvre même le bruit de la mer ... impossible de dormir la fenêtre ouverte. Homelidays m’a habituée à beaucoup mieux. Stunning apartments with spectacular views! Look at the pictures, its exactly what you arrive to. The balcony has a push button gate and the first time you open it your jaw will drop! The apartment is clean and modern and has everything you could need for your stay. We arrived as the cleaning crew was finishing up, which was nice as we saw them scrubbing floors and changing sheets. Very professional. The bathroom was lovely. You on right on the main drag, the fresh Mediterranean air blows right into your bedroom!! There is a full market right behind this building which is super convenient. The beach is right across the street. Amazing BLUE waters!! You are steps away from restaurants, bars and shopping. The best part may have been the ease of gaining entry to the property with keys and intructions on day one and the ease of leaving on your final day. This property is managed WELL. My only complaint would be the bed was a little stiff for my liking, but my wife prefers a firmer mattress. Happy wife, happy life. Nice is an amazing city, and this is the absolute perfect property to stay in, especially for couples. A bottle of wine to end each day (and maybe one to start!) on that balcony are moments we'll treasure forever. Thanks again guys!! And if youre reading this, just book the damn place!!! The location of the apartment is great, easy access to the city center and to the old town. The beach is across the road. A little bit noisy due the main road but the view compensate you. The cleaning should be improved. Well connected, easy to have a good time. 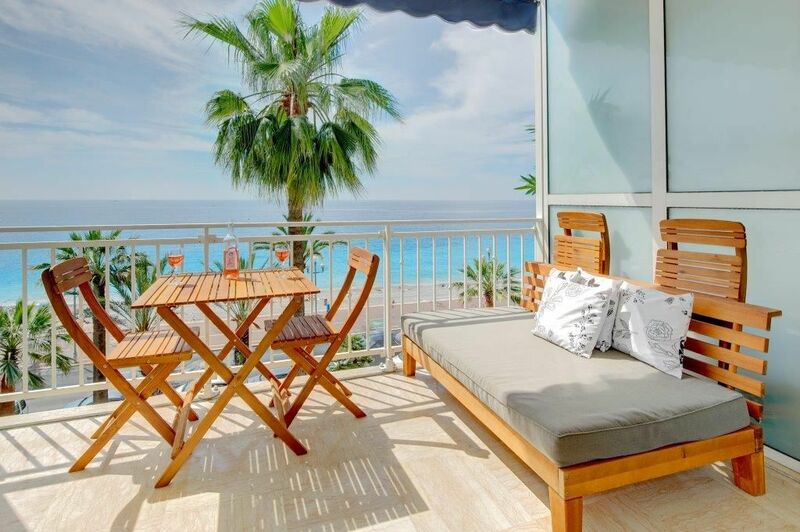 Pros: this property provides stunning views of the Mediterranean and the beachfrom the outdoor balcony and is conveniently located on the Promenade des Anglaise. There is a grocery store just around the corner and restaurants just a few blocks' walk away. Cons: the property is a bit run down and there are some inconveniences to deal with, including no power outlet in the bathroom, a challenging shower set-up and patio doors that don't close properly nor insulate the sound from the busy roadway outside. If you are value-conscious and plan to spend little time in the apartment, this is a good choice. Thanks for feedback - to note the owner is just in process of changing windows in early June 2018.